The tour of 21 days gives you a chance to explore the peninsula of Indochine which consists of 3 countries including Vietnam, Laos and Cambodia. It takes you on a journey of smiles, authentic experience, not only visiting the fantastic sights and attractions, but also getting to know the countries and its amazing people. Visiting the spectacular nature, well-known heritages, the simple daily life of local residents, their customs and culture. Warmly welcome at Noi Bai airport - Hanoi. Pick up and transfer to your hotel. If time permits, have walking tour around Hoan Kiem lake, Ngoc Son temple and Dong Xuan market. In the evening, enjoy welcomed dinner at your local restaurant. Enjoy breakfast at hotel then start a guided city tour of Hanoi. Having celebrated its 1000- year anniversary in 2010, the city has a rich and fascinating history. Your city tour will take you to the main attractions of Hanoi, including Ho Chi Minh complex (Ho Chi Minh’s mausoleum and stilt house); the Presidential Palace, the nearby One Pillar Pagoda, the Temple of Literature, West lake, Tran Quoc pagoda, Quan Thanh temple and of the city’s museum (History Museum or Ethnology Museum). Late afternoon, enjoy Water puppet show and cyclo visiting the Old Quarter of Hanoi. In the evening, board an overnight sleeper train to Lao Cai. The train arrives at Lao Cai train station very early. There will be a vehicle waiting to transfer you to Sapa. The drive to Sapa is only 33 km but it takes around 1.5 hours. Once to Sapa, enjoy the breakfast at the hotel. Then start your day tour by walking down to the South-west of Sapa (around 4 km) to visit Cat Cat village of the Black H’mong. Relax at the foot of the stunning waterfall and the vestige of a hydroelectric power station that was constructed by the French during the colonial time in Vietnam. Trekking next 6 km to Sin Chai, the village located at the foot of Fansipan Mountain, “the roof of Vietnam and Indochina”. In the afternoon, continue to visit Taphin village. You will have the opportunity to visit and explore the village where the Red Dao and Black H’Mong ethnic minority hill tribes live. Walking around the village to explore the custom, daily life and weaving technique of the local people. Back to the town. Check in hotel. Overnight in Sapa. In this area there are some fair markets which can't be missed (Can Cau on Saturday, Bac Ha on Sunday, Coc Ly on Tuesday, Xin Cheng on Wednesday). You will check out hotel early and leave Sapa for about 3 hours driving to the market. Join in the colorful market of the tribal people in this region. On the fair market the H'mong, Dzao, Phu La people in their best traditional costumes go to the market for shopping and meeting friends and relatives. Late afternoon, drive to the Chinese border gate for a short visit before driving to the railways station for night train to Hanoi. Arrive in Hanoi at around 5 am. A day room will be available, so you can have shower and freshen up before breakfast. At around 8 am, your driver will pick you up for the journey to Halong Bay and arrive at around midday to board a traditional junk for an overnight cruise. Halong Bay is widely considered to be one of the natural wonders of the world. Thousands of towering pillars of sea and wind-carved limestone karst make the bay an unforgettable sight. After lunch, explore some of the huge limestone caves dotted around the bay and visit a floating fishing village. Then the captain will find a secluded spot where you can swim, soak up the sun on the top deck, or try your hand at kayaking. In the evening enjoy a seafood feast for dinner. Being the ancient capital, Hue is surrounded with ancient tombs of the past emperors, and with Orient style - those tombs almost located near the bank of Hue’s river - Perfume river. In the morning, take boat trip along the scenic Perfume River for sightseeing and next stop will be the famous Thien Mu pagoda and Ming Mang Emperor’s mausoleum. After breakfast, leave Hue to visit My Son, a World Heritage, 50 km southwest of Hoi An. Located in a lush valley; My Son was a capital and religious center of Cham people, now remaining with red brick towers and sanctuaries. My Son, once the spiritual capital of Champa Kingdom that dominated South East Asia for nearly a thousand years and occupied most of the central parts of Vietnam from 2nd century to 16th century with very rich in history and culture. Contemplate its remarkable red brick towers and sanctuaries dating from between the 7th and 13th centuries. After the trip, transfer to charming Hoi An. Check in hotel and free time to explore the ancient town. The tour will provide your family a close-up and intimate exposure to both the local farming and fishing communities. Accompanied by your tour guide, you commence the day leisurely cycling along country roads witnessing local Vietnamese rural life first hand, discovering all manner of photo opportunities. Stop at Tra Que village, which is famous for its sweet scented green vegetables that spice up Hoi An’s famous delicacies. Join them in the fields and learn about their planting and harvesting techniques. You and your family can try ride a water buffalo in a rice paddy field, see duck swimming along the rice farm… The photo opportunities are endless. As well you will experience the friendliness of the local people greeting you along the way. Later you will board the Hoi An Eco-tour boat for a river cruise to meet and engage with local fishermen and enjoy a hands-on experience of traditional net fishing. You will also experience the unique Vietnamese bamboo basket boat through the waterways of coconut palm paradise. This tour provides you a unique cultural window into the Vietnamese way of life. Today you will catch morning flight to Saigon, Vietnam’s largest city has an exciting buzz as millions of people rush around on their daily business. The tour guide will pick you up at the airport and transfer to hotel. After a short rest, you will have a half day tour Saigon including The Reunification Palace, Notre Dame Cathedral and Old Post Office, Remnant War Museum and Ben Thanh market. This morning, you will visit the famous Cu Chi tunnels, an incredible underground tunnel network constructed by Vietnamese resistance fighters during the long struggle for independence. The network included innumerable trap doors, specially constructed living areas, storage facilities, weapons factories, field hospitals, command centers and kitchens. After that, drive to Tay Ninh province to visit Cao Dai great temple - one of the most striking structures in Asia. This temple is the holy land of Cai Dai religion - a mixture of Buddhism, Confucius, Taoism, Hinduism, Christianity…). You will have chance to attend the daily noon prayer. Come back Saigon in the late afternoon. Leave bustling Saigon for the 3 hour drive to the delta town of Cai Be. On arrival, board your boat for cruise in the Delta’s waterways. Following the breakfast at hotel, you take an early speed boat to Phnom Penh - the capital of Cambodia. Upon arrival, you will be welcomed at the harbor and transfer to your hotel. Start your city tour with a visit to Royal Palace. The Palace was opened in 1870 under King Norodom, and now contains the Royal Residence, the Throne Hall, the Silver Pagoda, and other buildings. Late afternoon, enjoy 1 hour of interesting tour by tricycle along the Tonle Sap riverfront. Have dinner at the local restaurant before back to your hotel. This morning, you visit Toul Sleng museum (S-21) and the killing field of Choueng Ek, which is about 35kim away from the city. These places are grim reminders of Cambodia's bloody past under Pol Pot. It is almost inconceivable to confront the nature of true evil here in this gentle land, but the Buddhist memorial at Choeung Ek, commemorates the 1.7 million victims of the 1975-79 Pol Pot regime. This excursion may prove distressing for some. After that, transfer to the airport for the short flight to Siem Reap. Upon arrival in Siem Reap, you will visit the incredible temple Ta Prohm. There are enormous fig trees and gigantic creepers which embrace themselves in the stone foundations of the structure giving the impression of man's creation being reclaimed by the powerful forces of nature. You also explore the grand circuit with Preah Khan, Kravan, Neak Pean, Krol Ko, Ta Som, East Mebon and Pre Rup Temples, where you can enjoy the sunset. Leave Siem Reap to catch flight to Luang Prabang - the royal capital of the former Lane Xang Kingdom, with its gleaming temple roofs, colonial architecture and stunning mountain backdrop retains a unique charm rarely found in all Asia. Here is plenty to see, some of which are the impressive stupa of Wat Visoun, the shrine of Wat Aham and Wat Mai with five tiered roofs. You include these sights in a half day guided tour, which ends with a climb to Phousi Hill to enjoy a beautiful sunset view of the city and its glowing reflection on the Mekong River. There are 329 steps leading you on zigzag way past various temples to the sacred, gilded stupa of Wat Phousi at the summit. This morning, you continue to explore Luang Prabang with the temple of Wat Xieng Thong, a magnificent piece of architecture, which nestles at the meeting of the Mekong and the Nam Khan River. The temple structures are decorated in various ways with gilded stuccoes as well as doorways and the main sim has a marvelous 'tree life' mosaic pattern on an outer wall. After that, you take a drive 30km to visit Tad Kuang Sii waterfall. The falls cascade over many calcified tiers and down several hundred feet into a series of cool, turquoise pools. The water here has a clear blue-green tint due to the high mineral content. You can climb the stairs and look down from various high viewpoints on the way to the top! Enjoy a picnic lunch and later in the afternoon return to the hotel to relax or explore on your own. Luang Prabang is a wonderful walking town, and you can find dinner on your own at any number of fine international restaurants. Free time in Luang Prabang until be transferred to the airport for flight to Vientiane - the fascinating capital of Laos. On arrival, you have chance to visit the Morning Market and the weaving village of Ban Nong Bouathong. After breakfast, you have the full day tour of the capital; including the oldest Wat Sisaket, the temple with thousands of miniature Buddha statues and the former royal temple of Wat Prakeo, which previously housed the famous Emerald Buddha Image. On the way to Lao’s national precious heritage, the famous and sacred structure of That Luang Stupa, you stop enroute to take some pictures of the imposing Patuxay Monument, which is well known as Vientiane’s own Arc de Triumph. In the afternoon you transfer out to see the Buddha Park, a scattered enchanting collection of Buddhist and Hindu sculptures on the Mekong Riverside meadow, close to the Friendship Bridge. There are approximately 200 religious images dating back over 500 years, which were created by a mysterious monk spreading his philosophy on life and revealing his ideas about the universe. A spectacular view of over the Mekong River at sunset is a perfect way to finish the day. Free in your own until your departure time. Your driver will transfer you to the airport for your departure flight. End of the service. Cảm ơn và chào tạm biệt. Speed boat Chau Doc - Phnom Penh. 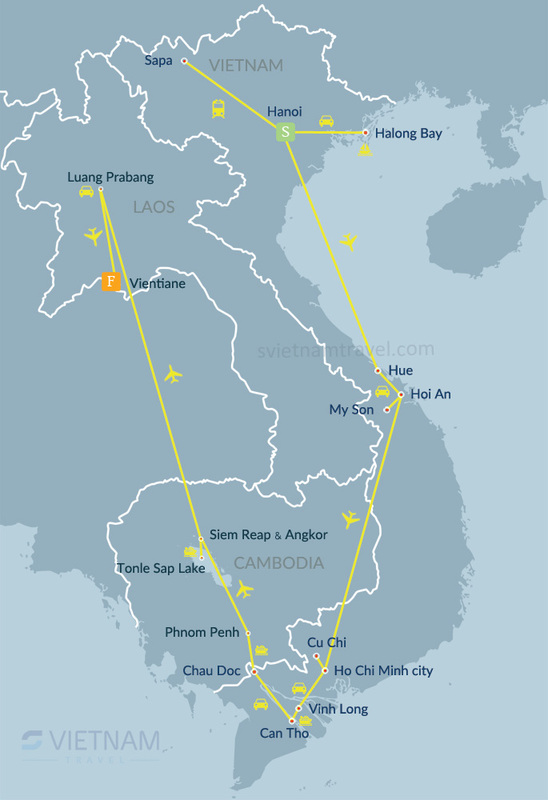 Flight tickets Hanoi - Hue, Danang - Saigon, Phnom Penh - Siem Reap, Siem Reap - Luang Prabang, Luang Prabang - Vientiane.